NK Coatings » The market-leader in metal finishing services in Ireland. | The market-leader in metal finishing services in Ireland. 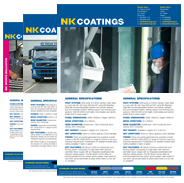 Welcome to NK Coatings Ltd. Based at Mallusk, Belfast, we are the only fully comprehensive service in the country offering a one-stop-shop for galvanizing, powder coating, thermal breaking and shot blasting services all under one roof. Dispatch Supervisor Dave, handing over the keys of the new lorry to Warren.